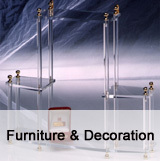 Acrylic lecterns and podiums. Lectern church. Pulpit for churches. 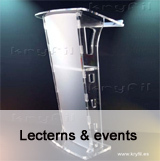 In our lecterns and events section you will be able to choose among up to 40 models of acrylic lecterns and podiums. Acrylic Pulpits, combined lecterns, autoamplified lectern, Pulpit and podiums for Churches, lecterns for conferences, easels exhibitors and much more. 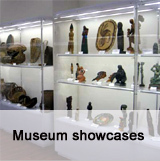 In the museums section you will see a sample of the works realized with the models of showcases for museums and showrooms. 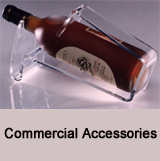 In Hotel and catering business and Trade section you will be able to find complements made of methacrylate for bars and restaurants, Cars of tarts, food protections, acrylic decorative elements, etc. 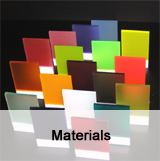 In Furniture and Decoration you will find decorative elements in methacrylate, such as tables, TV carts , window boxes with light, etc. 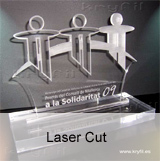 In our laser section you will be able to see a sample of the works we can realize by means of the technology of laser cutting, as trophies, engravings, silhouettes etc.